“I know not what it is.” These words from the Clavis sanationis are significant. Written during the last quarter of the 13th century by the Italian physician Simon of Genoa, this medical language dictionary wanted to enable its readers to possess the “key”, as its title indicates, to understanding the medical terminology of the age. This dictionary would decipher the seemingly esoteric terms that had crept into the medical literature of the late Middle Ages; and yet, even as great a lexicographer as Simon was, he confessed to being lost and conceded to not knowing all the terms he came across. On more than one occasion, he denied having a complete understanding even after having spent thirty years digging through libraries looking for rare medical books and reading a great number of them. Undertaking this task was crucial because it dealt mainly with plant names prescribed by doctors to their patients for their illnesses. If a medical literary expert such as Simon could not always identify the plants mentioned in the literature, where would that leave physicians who probably had little time to devote to inquiries as deeply and tenaciously as Simon? And this does not include healers of all sorts, who were neither formally trained nor even literate, or midwives working in country cottages, who would help women avoid unwanted pregnancies or deliver their babies when contraceptive potions were ineffective. And what of the charlatans who promised quick relief at exorbitant prices for ineffective remedies some of which, due possibly to ignorance, or even deliberately, were downright poisonous? If all the complaints regarding the ignorance of pharmacists, as they are called today, are true, it would be like a scandalous refrain resounding through the history of medicine. Did not Pliny, the ancient Roman encyclopedist, lament the lack of knowledge of medicinal plants by his contemporary herbalists who would have been specialists? Then one looks to unexpected developments of plant names affecting the known lexicology during the long passage of the Middle Ages – the ten centuries from the founding to the fall of Constantinople (324 AD to 1453 AD) – when different populations made their entrances on the European scene and, in particular, the Mediterranean basin. All these groups would have brought with them their vernacular languages, their customs and practices, their faiths and rites as well as their illnesses and the plants to cure them. Whereas Latin, Ancient Greek, and Arabic were the international languages that unified populations or a portion therein, either briefly or not, there were nonetheless many other languages, contributing to a sort of Tower of Babel in communication and misunderstanding engendered by linguistic particularities. Then as now, there was much borrowing from one language to the next to facilitate understanding, particularly along borders. But even with such osmosis, certain terms were impervious to change and are still today. The plants used to treat illnesses by different groups were one of those material elements in culture that resisted assimilation – the more so because the plants not only had medicinal properties but also possessed a quasi magical sacredness due to their effect in alleviating ills. It is no wonder then that they were made the object of an infinite number of verbal creations, such as reference to what they treated, the projection of feelings they might inspire, their association with visual images, comparisons with animals, not to mention the antonomasia which might transform maleficent herbs into beneficial ones be it only in word. As the population was mostly rural, people who were born and lived in the countryside knew plants by a panoply of traditional names rather than by their scientific ones. Even when local names at times reflected a cultural mix that resulted from extensive contact with various populations, there were other instances when deeply rooted cultural traditions prevented mutual understanding. In the meantime it was necessary to agree on names as plants were part of everyday life and not only maintained health and nutrition in daily repasts, but served many other uses: from wool carding and dyeing to religious ceremonies and the consecration of different phases of life such as birth, baptism, marriage and death. The doctores and physici who were given charge of their patients could probably have written multilingual dictionaries. But their compiled lists would have been difficult to handle and clumsy to use and they would have been inaccessible to the majority of people who were not literate. A better solution emerged: to illustrate the plants and accompany these illustrations with all their various names whether in different languages or just one, so long as all their variations were included. This new approach using a visual reference would allow for correct identification and greater understanding as well as provide a common denominator for the entire gamut of lexical production for plants. From their interpretive role as illustrated works deprived of text, these works probably changed function and became collections which transformed botanical literature. It was no longer necessary to illustrate volumes written about plants and their uses as these albums of illustrations would be available independently and could be consulted and used by readers of any language provided they contained the names of the plants in all the languages. 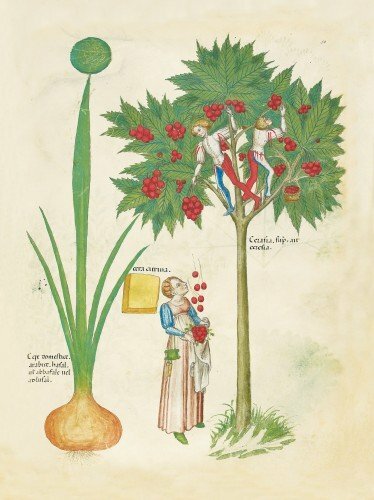 Such is the British Library manuscript, Sloane 4016, which is customarily referred to as Tractatus de herbis, a book with no text other than the captions for its illustrations. It is a (universal) book that could be used in its time by readers of all languages, all origins, a book which connected the people of the Middle Ages regardless of their erudition, their education or work activities, thanks to its visual nature. This book, based solely on the image, promoted understanding that transcended the many differences of the time and revealed the Middle Ages to be, far from its too common ignominious reputation, perfectly capable of mastering the technique of visual communication and with an element of modernity that we previously could not have imagined.